Inexpensive sanitary water delivery system for small to medium parrots and pet birds. If you have your own recycled bottle, this is a Water bottle setup kit for small birds: Canaries, Cockatiels, Parakeets, Finches. All you need is an empty glass bottle, i.e. a tea bottle. Cost efficient way to keep your bird drinking fresh water. If you have your own recycled bottle, this is a Water Bottle Setup Kit For Medium Birds: Conures, African Greys, Quakers, Senegals, Amazons. 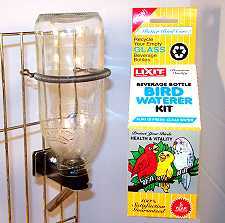 A cost efficient way to keep your bird drinking fresh water. Choose tip size in drop down menu above.